April 1985 issue of Forrest J Ackerman's Monsterland. Near-mint condition. This is the second issue of FJA's mag that was published after the demise of Famous Monsters. 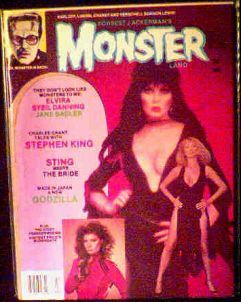 The Elvira issue is the most sought after of this series. This issue also features a "Letter-to-the-Editor from some fellow named Mark in Lexington, VA.
Website design and hosting by Sohodojo Business Services. Item 250 of 466 items displayed in viewer. 0 items in cart.